There was a noise in the night which was most likely this shelf collapsing on the left side as a support peg snapped. Unloading the shelf’s double layer of books. I had to raise the shelf one notch as one of the predrilled peg-holes had been damaged by the collapse. Then I restored the books in a slightly different way as the shelf height was too low for the taller books in the back layer (stacked horizontally instead of vertically). 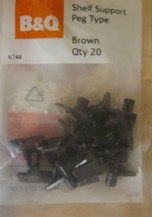 Fortunately I managed to find a pack of shelf support pegs from the last time I had a shelf collapse. Unfortunately I think they are the same pegs as the one that broke this time so it might happen again. Maybe I’ll get stronger pegs next time.